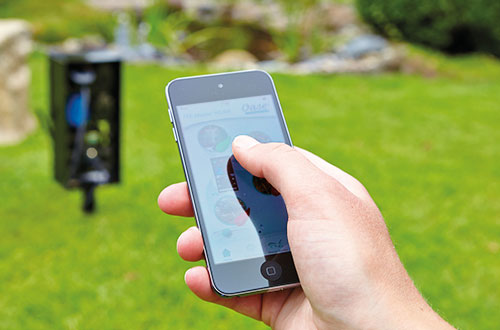 The new EGC Easy Garden Control concept from OASE. Smart phone or tablet controlled equipment. OASE Germany are revolutionising how we can now control and communicate with pond and garden technology by developing the new EGC Easy Garden Controls and compatible pond equipment. At the heart of the EGC principle lies the FM Master WLAN EGC Smart Controller which, when connected to EGC compatible equipment, will allow the user to control the various functions via an initiative App on Android and iOS phones and tablets. For more details and EGC compatible equipment, please see below. 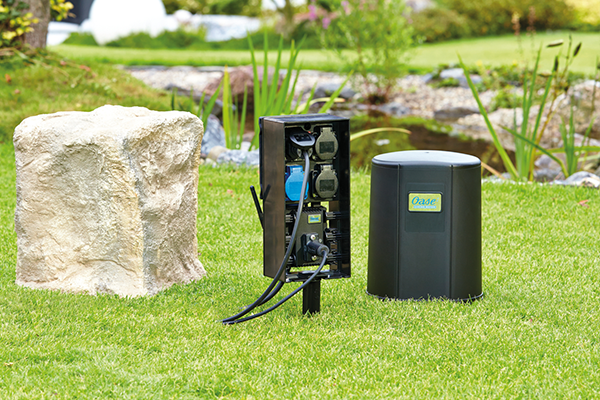 The term 'EGC' refers to OASE Germany's new 'Easy Garden Control' system and its compatible pond equipment such as submersible pumps, filtration and garden lighting. With over 1.5 Billion smartphone users around the globe (and growing), the demand for controlling your life and the technology around you are becoming ever more popular. The demand for environmentally friendly, low energy equipment is also growing and OASE have both these key points covered with the EGC concept. At the heart of the concept is the WLAN EGC Controller which supplies power to the equipment but most importantly, the controller features a cable port for linking to the EGC enabled equipment, providing a 2-way communication link. The downloadable App will then allow the user to communicate and control the connected lights, pumps and filters via a smartphone or tablet, from anywhere in the world if desired. 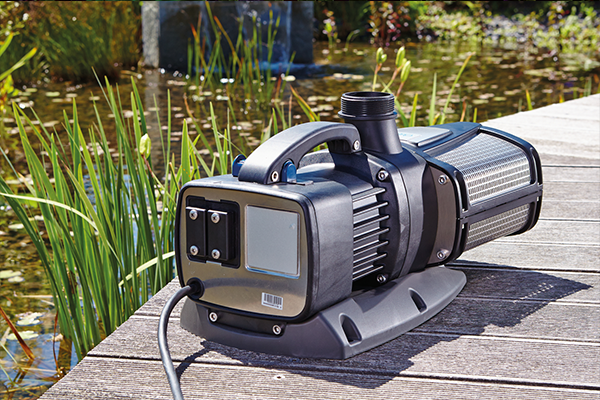 The fully weatherproof FM Master WLAN EGC controller can be mounted discretely, usually within a 10-metre radius of the pond or water feature to prevent the need to extend pump, filter or lighting power cables and communication cabling. A mains power connection is then made to the controller. The controller features 4 plug sockets to facilitate on/off control of any outdoor electrical device, switched on or off conveniently via the downloadable smart App. One of the four sockets also features variable control, allowing certain asynchronous pumps to be electronically regulated for flow, again via the smartphone App. Not only will this control the flow digitally but reducing flow will also reduce the power consumption. The WLAN EGC really steps up a gear with its main function - the EGC connection port. A special EGC Connection Cable is fitted into the 5th port on the controller and the other end of the cable is then connected to any EGC enabled device listed above. 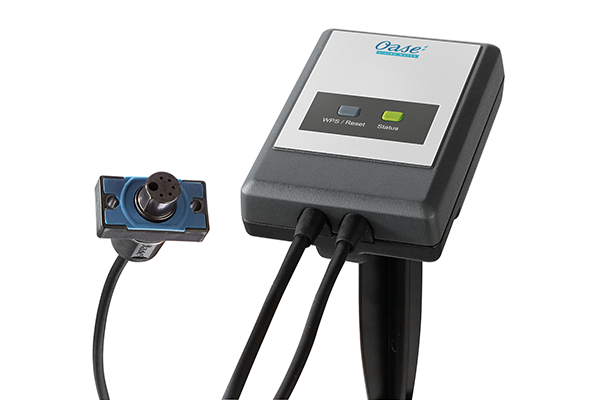 The cable allows the controller to communicate with the EGC pump, ProfiClear filter or RGB lights via the App, giving you a number of control options. The new EGC Control Cloud offers the same functionality as the WLAN EGC controller but without the 4 mains plug sockets. The cloud function will allow connectivity and communication with the EGC enabled devices from anywhere in the world via your smartphone or tablet, providing Internet access is available. The stunning ProfiLux Garden LED RGB spotlights are designed specifically for connection to the WLAN EGC controller or the EGC Control Cloud unit to facilitate a range of colour changing pre-programmed scenes such as fire, ice and rainbow. Single colours can be selected if preferred and brightness can also be adjusted to suit. When a colour scene is selected, it is also possible to alter the tempo of the colour changing sequence. 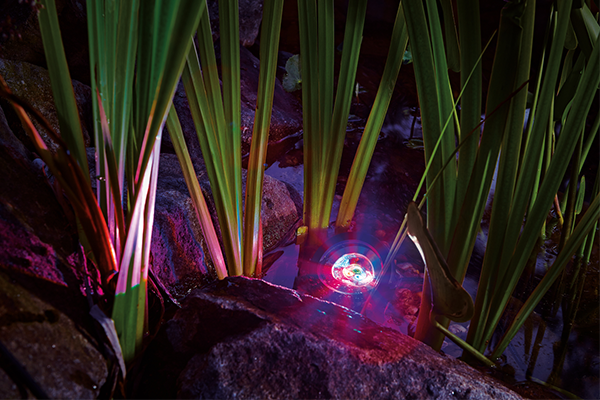 The ProfiLux RGB spotlights are powerful yet very compact and can be used on dry land or submerged up to 4 metres deep in ponds, lakes, rills and water features. The Aquarius Eco Expert 22000, 28000, 36000 and 44000 pumps can be linked to the WLAN EGC or EGC Control Cloud devices to create stunning fountain displays or dramatic water cascades. 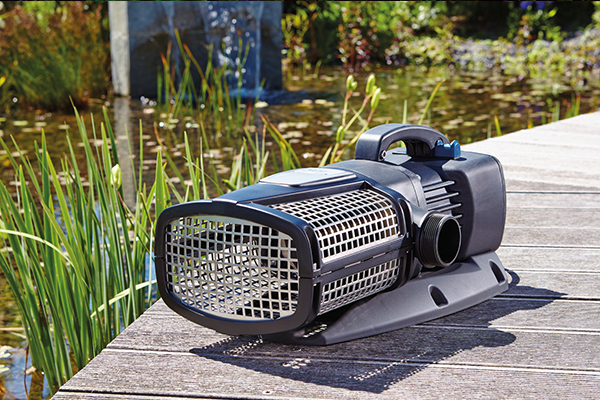 These powerful pumps can be dry installed or submerged directly in the pond or water feature. The controller will allow the user to select from numerous pre-programmed dancing water displays in addition to setting timers and digitally dimming the water flow. Feedback with regards to the impeller's rotational speed and power consumption is also available alongside any motor errors detected and a temperature sensor can also be toggled on or off. The Aquarius Eco Expert pumps can be linked to our range of decorative Fountain Nozzles to create spectacular dancing fountain displays and up to 10 pumps can be connected in a daisy chain formation to one controller. For larger water cascades, streams, rills or water features, the AquaMax Eco Expert 21000, 26000, 36000 and 44000 pumps deliver considerable flow and are fully EGC enabled for control via the WLAN EGC and EGC Control Cloud. These pumps are also well suited to supply water to pond filtration systems due to their solids-handling capability. The flow rate can be digitally controlled via the smart App which will also reduce running costs. The pump will feed information back to the controller to monitor operating hours, impeller rotational speed, real-time power consumption figures, motor errors and motor temperature. Up to 10 AquaMax Eco Expert pumps can be daisy chained and controlled via the single controller. The AquaMax Eco Titanium pumps have been specifically designed to supply water to gravity fed pond filter systems with the absolute minimum power consumption. These also make excellent push pumps to increase water circulation in ponds and lakes, eliminating stagnant zones. 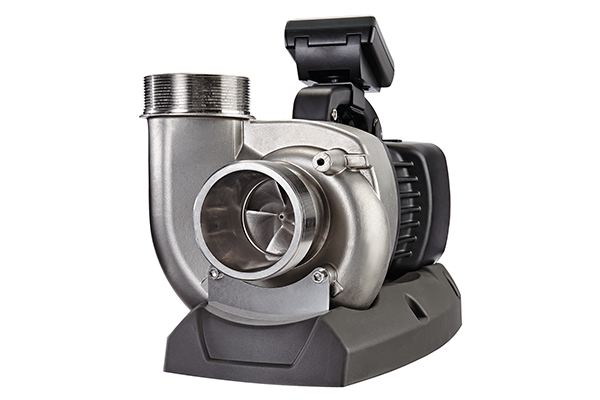 The Titanium pumps can be linked to the EGC controller to offer the same functionality and feedback as the AquaMax Eco Expert pumps. 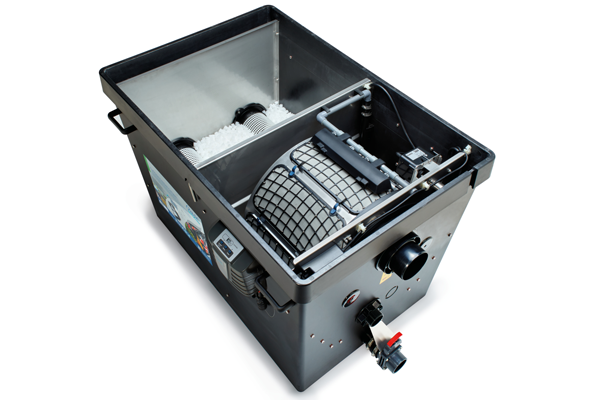 OASE are introducing EGC capability to their innovative range of ProfiClear Premium automated pond filters, offering complete control to the user when coupled to the WLAN EGC or EGC Control Cloud. Adjustment of the cleaning cycle time, cleaning interval time and manual cleaning triggering can be performed from anywhere in the world whilst real-time feedback is given with regards to current water temperature, cleaning cycles over 24 hours and total lifetime cycles. It is also possible to be sent email alerts should the drum filter fail to perform automated cleaning cycles, become offline, suffer motor blockages or perform too many cycles, allowing you to make arrangements to repair the fault remotely, should this occur when you are away from home. OASE have a demonstration of the Easy Garden Control App which will allow you to play with the various settings for compatible products. Simply click the 'register' icon to automatically access the demo controller. If you have any questions with regards to the EGC controllers or compatible products, please feel free to Contact Water Garden Ltd for expert advice.